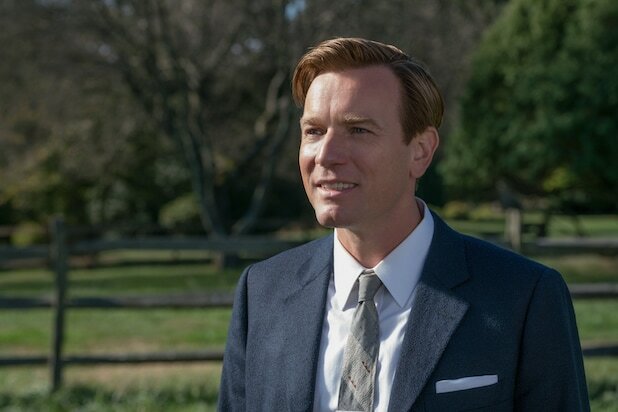 With his movie-star looks and his bottomless reservoirs of charm, Ewan McGregor figured to be a good match for Philip Roth‘s “American Pastoral.” The book, which won the Pulitzer Prize in 1998 and features Roth’s frequent alter ego, Nathan Zuckerman, is about a golden boy whose looks and charm can obscure but not overcome the wreckage that lurks beneath the gleaming surface. McGregor chose “American Pastoral” as his directorial debut, working from a screenplay by John Romano with a cast that includes Jennifer Connelly and Dakota Fanning. The result premiered on Friday evening at the Toronto International Film Festival, and showed that McGregor is indeed a good fit, but that the intricacies of the page do not entirely lend themselves to the screen. Roth’s novel spends about 150 pages on virtuoso authorial throat-clearing, as Zuckerman explains why he was drawn to the story of “Swede” Levov, the star athlete of his school days. The film dispenses with this fairly quickly with a framing device featuring David Strathairn, who doesn’t have much to do but who as usual is incapable of hitting a false note. But the story itself is also a tough nut to crack. This is the story of a guy who seems to be breezing through life until suddenly he isn’t, and the story of how we get people like that wrong when we see and judge them from afar, blinded by athletic prowess or beauty or a thriving business and a perfectly manicured lawn. In the novel, we hear Roth’s (or Zuckerman’s) voice as he struggles to understand the guy he idolized as “the Swede” – but in the movie, where the author and his voice are absent for most of the running time, the Swede’s glories are dispensed with early, so they don’t cloud our vision the way they do the author’s. That makes it harder to see him as a golden god and be shocked by his imperfections. To compensate, perhaps, McGregor opts to give the film the feel of the Swede himself: This is a placid, friendly, burnished piece of filmmaking, measured and controlled and beautiful. Its look is meant to hide the trouble beneath the surface in the same way that the Swede’s perfect smile masks the enormous effort required to keep people thinking he’s perfect. McGregor plays the Swede with the right blend of charm and doubt, with a radiant Connelly as Dawn, his troubled beauty-queen wife, and a feral Fanning as Merry, the inaptly-named daughter who viciously turns on her upper-class parents in the late-’60s countercultural ferment stirred up by the Vietnam War. When Merry is implicated in a bombing and goes undercover, the movie slowly and quietly goes about the business of detailing all the cracks that threaten to bring down the Levov façade. As he desperately searches for the daughter he doesn’t know how he lost, the Swede winds up trading his easy glories for profound confusion. He’s a man who did everything right up to the moment when he did everything wrong – and as a cop points out at one point, he has to figure out exactly when that change took place. If Roth’s novel eventually resists McGregor’s attempts to create a work as satisfying as its source, “American Pastoral” takes an admirable crack at it. The film looks great, the performances are fine and it has plenty of moments that sing — among them a biting scene in which Valorie Curry, playing a strident young revolutionary, flings all the clichés she can muster at the Swede and the beauty queen. She’s blind to how far off she really is, while the Swede is blind to the truths in some of what she says. At that moment, “American Pastoral” gets to Roth’s theme: We think we understand people, but we never fail to get them wrong. It’s one of the many things McGregor has gotten right.